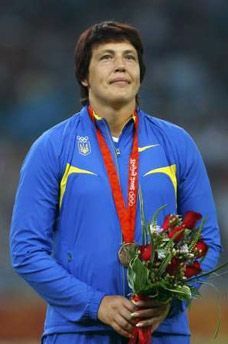 Olena Antonova of Ukraine has won the Olympic bronze medal in the women’s discus throw on Monday, according to AP. Stephanie Brown Trafton of theUnited States has won the Olympic gold. The 28-year-old Brown Trafton, from Galt, Calif., who was third at the U.S. trials but had the best throw by an American this season, won the Olympic title Monday with a best mark of 64.74 meters (212 feet, 5 inches). Yarelys Barrios of Cuba, a bronze medalist at the last world championships, took silver at 63.64 (208 feet, 9 inches) and Olena Antonova of Ukraine won bronze at 62.59 (205-4).